Energy Dynamics: Part 2 - Fallacy No. 2 - After I Zero Out My Bill HECO Gets It For Free! Part 2 - Fallacy No. 2 - After I Zero Out My Bill HECO Gets It For Free! An article in Sunday's Wall Street Journal, Hawaii Wrestles With Vagaries of Solar Power, gives an easy to read, albeit broad, description the impact of high levels of variable renewable sources has on Hawaii's electric grids. Fallacy No. 2 - After net-meter customers zeros out their electricity bills (this does not include the minimum charge), HECO gets all their excess electricity for free! So what's the problem? 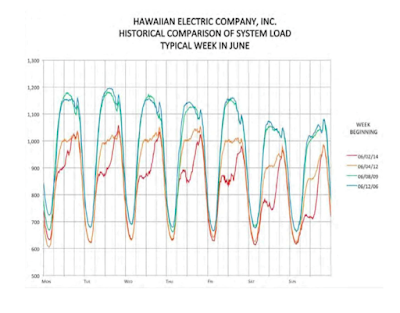 Fact - Below is a historical comparison of system load for a typical week in June for the Oahu grid. The exponential growth of rooftop PV and efficiency programs impacts are pretty evident, resulting in a decrease in system load as noted in the difference between 2006 and 2014 (blue and red). But more so, between 2012 and 2014 (yellow and red) reflects the exponential growth of rooftop PV, due to several factors, how the renewable income tax credits was interpreted and applied, new financing options (power purchase/lease options) and changes to interconnection standards. Currently, the aggregate total of rooftop systems on Oahu exceeds HECO's largest available fossil generators. However, fossil generators are needed to be available to steadily ramp up to meet the early evening peak as well as smooth out the variability in output from intermittent renewable sources. Several things are happening here. 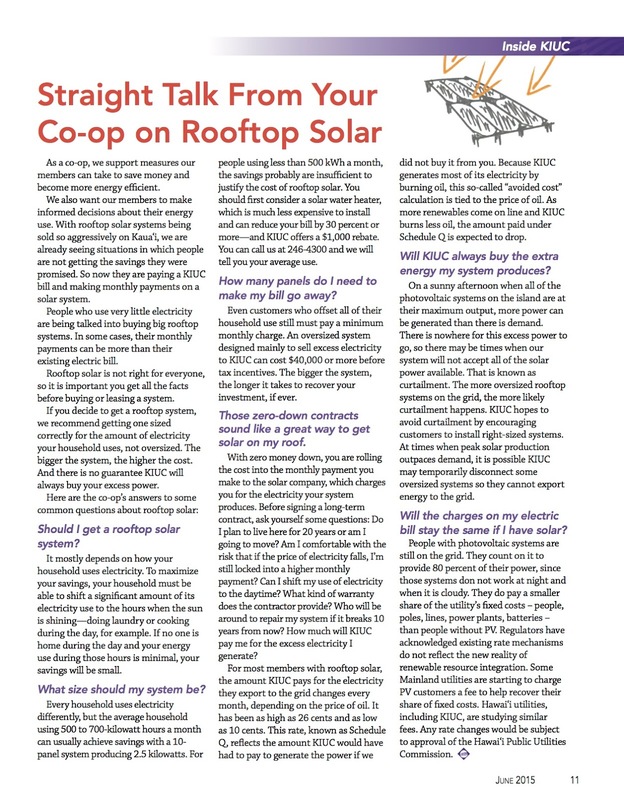 These rooftop systems (until smart inverters installed) are generally "invisible" to the system operator, therefore are not "controlled" by HECO. To balance supply and demand, when too much electricity is generated the HECO system operator must "adjust" the generators they have full control over. At times this means HECO generators and/or IPP generators (fossil and renewable) whose electricity may cost less than rooftop solar must be curtailed to accommodate the higher cost rooftop PV. Then as the rooftop output declines in late afternoon and into the evening, net-metered customers must draw power at peak period when the production of electricity is the most expensive. Simply put, residential net metered customers' maximum output is during a period it is less likely to be needed and draw electricity from the grid at the most expensive production time. 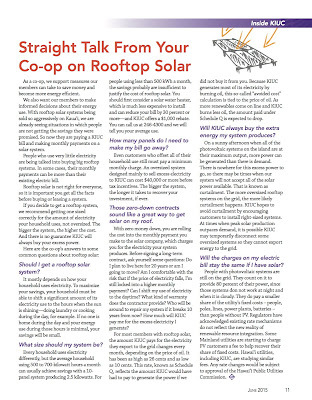 While rooftop PV advocates may argue there are other system benefits that are not accounted for, in general, those benefits still need to be evaluated and priced accordingly and relate to our grid size and island conditions (larger grid/mainland studies have limited applicability in an island environment). Conclusion - Currently, oversized systems are creating integration challenges and there is a cost to accommodate these systems especially during periods when its power is not needed - so no, HECO or its non-PV customer is not getting the excess electricity generated by net meter customers for "free." And, this will lead us into addressing the next fallacy - energy storage is the panacea. Whenever HECO suggests changes to the net energy metering program they are met with a huge barrage of criticism. As the rooftop PV market gets more saturated, there is a lot of sales and marketing hype. I hope this "straight-talk" from the member-owner electric cooperate, Kauai Island Utility Cooperative (KIUC) can help all electricity consumers make informed decisions. If you are having a hard time reading the article, click here for the June 2015 issue of KIUC's Currents magazine and go to page 11 for the article. Whether you get your electricity service from an investor-owned, cooperative or municipal utility, the overall objective is the same - clean, reliable and affordable electricity for all customers not just those who have access to a rooftop PV system.